Thousands of people gathered to take part in the namaz-e-janaza of a young man. His body was wrapped in our national flag; black pennants were raised to mourn his untimely demise. Our countrymen have seen many brutal deaths in recent times, harrowing footage of young people being senselessly beaten or hacked to death in political clashes, but this death, this killing, shook the nation to its very core. This murder wasn't a crime of passion or the result of a sudden frenzy, it was cold and calculated and it was done to send a message. A message that says, this is what will happen if you speak up for what you believe in. This was an unspoken warning, sent to silence a generation that has finally risen against the injustice of 42 long years. The victim was Ahmed Rajib Haider, a 30-year-old architect and blogger, involved in organising the biggest mass movement Bangladesh has seen in almost 20 years. The movement started with a small group of bloggers and activists protesting a verdict issued by the International Crimes Tribunal (ICT), of a life sentence in prison, in the case of assistant secretary general of the Jamaat-e-Islami party Abdul Quader Mollah (Butcher of Mirpur) convicted of crimes against humanity in '71. This movement, within a matter of days, turned into the heart and soul of the entire country. An overwhelming 500,000 people have come out of their homes to join in the protest to express their disappointment and refusal to accept what they believe is an inadequate punishment. 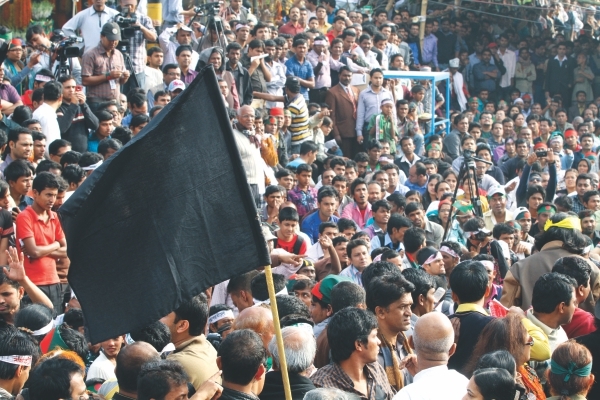 They have gathered at the capital's Shahbag, now referred to as the Projonmo Chottor (New Generation Roundabout). The protest is like none other independent Bangladesh has ever seen. Unlike Jamaat and their student wing Shibir, who have killed, vandalised and terrorised to try to influence ICT's verdict during the trial, this movement is a sustained, non-partisan and non-violent protest. Participants come from every socio-economic background, religious group and various educational institutes of the country. They are not breaking and burning, instead, they are singing, chanting slogans and holding candles. Shahbag protesters are now fighting back online through a group called “Cyber Warriors” who can be seen sitting on the pavements of Shahbag on their laptops and smart phones creating awareness and sharing the spirit of the movement worldwide. “The response we have received has been encouraging,” says Amit Tripura. “People from different districts of the country as well as Bangladeshis abroad are holding their own Gonomoncho and showing their solidarity with the movement in their own ways. We received news from people through their blogs about cancelling their accounts with Islami Bank, and medical institutions refusing to purchase medicine and supplies from Ibn Sina and it gives us hope that we will be successful in achieving our goals soon,” he says. Facebook pages created for this movement such as the Shahbag Andalan and Shahbag Square have 8 to 9 thousand likes, while Shahbag Cyber Juddha (Cyber war in Shahbag) has over 44,000 likes and counting. Updates regarding the protest are available for friends of those who like the page, therefore spreading the word to an increasing number of people. A large group from the current generation is playing a major role in educating people about this movement through social networking sites, by posting updates and photos of the Projonmo Chottor on their personal pages and encouraging people to show their support. However, there are those who remain conflicted and skeptical. 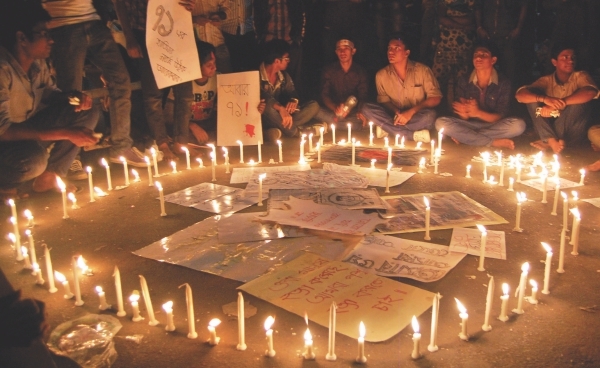 Shahbag protesters hold candle light vigils, sing patriotic songs and paint their demands creatively while collectively expressing the movement's desires. The social networking sites reveal a variety of emotions ranging from passionate support of the cause to vehement opposition of it, but overall the positive seems to be outweighing the negative. However, Jamaat continues its campaign of terror to discourage those who are outspoken. “Three days before Ahmed Rajib Haider was murdered, a post appeared on a blog known as the Shonar Bangla, about him, stating that he was involved with the Gonojagoron Moncho,” says Imran H Sarker, “The post included his blogger's ID and a link to his Facebook page. It cannot be a coincidence that he was murdered three days later. In fact, I received news today that Jamaat has been going around saying that they will kill whoever participated in Rajib's janaza. Even the way in which he was killed (stabbed) is very similar to the murders committed by Shibir in the past,” he claims. The efforts to malign the movement by targeting those at the centre of it, however, seem to have been futile as people thronged to Rajib's funeral prayer to honour his death. 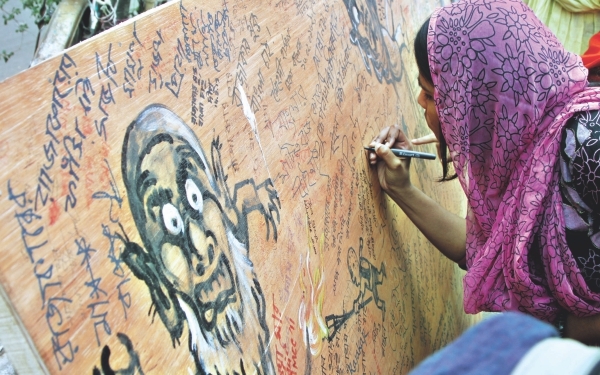 The journey from Shahbag: Where will all this lead to? It started off as a gathering of a few people at Shahbag intersection, brought together by Bloggers and Online Activists Network, protesting the International Crimes Tribunal's verdict of sentencing war criminal and Jamaat-e-Islami leader Abdul Quader Mollah with life imprisonment. As the days passed the protest gained momentum attracting people from all walks of life; irrespective of religion, ethnicity and age, chanting slogan for the absolution of the politics of nurturing the war criminals of 1971. 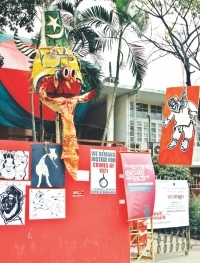 Running into its second week, the Shahbag protest has spread throughout Bangladesh, giving it the colour of a non-partisan nationalist movement. 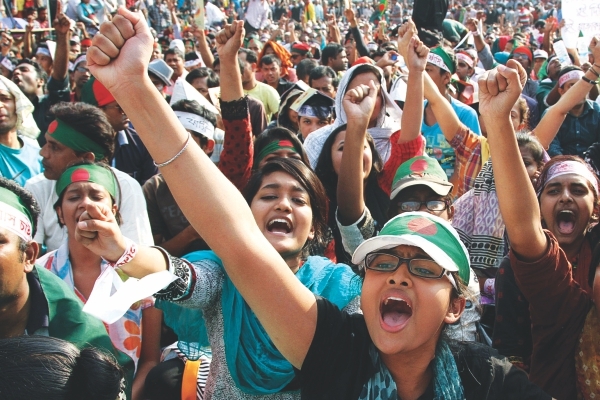 The protesters at Shahbag have placed a six-point demand to the government which includes, serving capital sentence to all war criminals, amendment to the International Crimes Tribunal Act, banning Jamaat-e-Islami and like-minded religion-based political parties, anti-liberation forces and collaborators of Pakistani Army in 1971, banning all businesses, socio-cultural bodies and media outlets run by war criminals, trying war criminals who were convicted and were under trial before the coup of 1975 and finally trying political parties, forces, individuals and organisations that are attempting to save war criminals and hatching a conspiracy to foil the on-going trial. 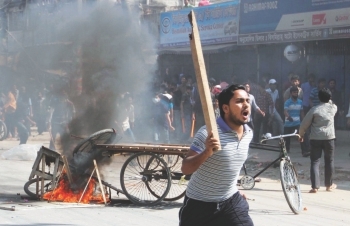 Terming their demands as long awaited and the protest as an outburst of the latent anger in Bangladeshis' mind, Hussain observes, “It is only natural that the Liberation War occupies a special place in the hearts of the people of this country. But all the governments and political parties have used Liberation War to their benefit.” She says that unlike her own generation, that has witnessed the war, the young generation, associated with the Shahbag rising, views the Liberation War objectively. “They believe that the struggle for freedom of the people of this region was right. Unfortunately, the course has not continued because war criminals were not tried. That is why they feel that this has to be done first,” Hussain explains. He says that the same rationale works in the case of trying the war criminals. Answering the international community becomes difficult for a Bangladeshi youth as to why war criminals of Bangladesh enjoys impunity, were reinstated in the country's politics and even allowed to accede to power, explains Majumdar. Majumdar opines that the youths are openly announcing that the outcome of 1971 is better than that of 1947. He highlights the two-nation theory based on which the Partition of the Indian subcontinent took place. The assumption under this ideology was Indian Hindus and Muslims are two distinct nationalities, regardless of ethnic or other commonalities. However, the theory proved wrong in case of the then West and East Pakistan where the difference in ethnicity, culture and language became one of the main reasons of dissidence between the two wings. “In 1971, language-based nationality had won over religion-based nationality, but it was not eradicated. From 1975 to 1996, it resurfaced continuously under state sponsorship. After 2001, those people directly became part of state power. Today the challenge they are facing is necessary because the ideal that this nation should follow is being decided on the streets,” Majumdar asserts. Mentioning the anarchy created by Jamaat-e-Islami in support of the war criminals in the last two months, he points out how ordinary citizens watched in fear as police was turned into a helpless force under such circumstances. “The people who come here (to Shahbag) do not belong to any single political party. There are supporters of BNP (Bangladesh Nationalist Party), leftists, Awami League— but one thing they have in common is that they were apprehensive about the existence of the nation,” he notes. “The nation as a whole is protesting against war crimes, religious extremism and communalism,” he adds. The government has already responded by amending the law allowing appeal against any inadequate verdict of the war crimes tribunals with the Appellate Division of the Supreme Court and also empowering the tribunals to try various organisations alongside individuals for crimes against humanity committed during the 1971 Liberation War. The protesters consider this step by the government as their first victory. However, the actual realisation of their demands is likely to have a far greater consequence in our political front. In fact, Hussain feels that this movement is just the beginning of a bigger clash between the anti-liberation, communal forces and the generation, who wants to see the vision of the Liberation War materialise. Referring to the continuous flash attacks of Jamaat-e-Islami and Islami Chhatra Shibir on law enforcement and also the murder of one of the activists of the protest, Ahmed Rajib Haider on February 15, Hussain says, “This may lead to a bigger clash for which we need to be prepared.” Comparing the situation with that of 1971, she observes that unlike 1971, the fight is against an enemy within our own community, not an outside force as the Pakistani Army. She fears that if this clash continues then it may lead to a class struggle. “Although Jamaat never gets too many votes, a considerable portion of the population supports Jamaat. Another important thing is Jamaat too has lots of young supporters,” she remarks referring to the Shibir activists. “We need to understand why these young people support Jamaat's politics”, she analyses saying that Jamaat helps the underprivileged class through different means, often providing them with financial help. “As a result their recruitment has increased and they do not recruit only from madrasas,” she observes saying how Jamaat presents religion as an ideal to follow amidst the current over-imposing materialistic culture. Referring to a study conducted by her department, she says, “It is also perceived that Jamaat politicians are relatively less corrupt.” She says Jamaat is addressing the needs of the young force using different mechanisms which the main two political parties as well as the left parties have failed to do. Yet Hussain believes that this rising has shaken the very base of Jamaat and they cannot continue to fight this way. 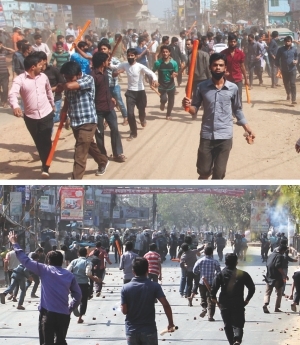 “If the state can take the situation under control then these clashes can be stopped. Otherwise Jamaat might engage in a bigger and directly confrontational fight. Besides, they have strong financial support. They get financial support from the Middle East and Muslim countries; they have financial institutions within the country; even non-profit organisations all over the country. It is very unlikely that they will not use the power of all these resources and wage a civil war just as they had threatened,” she says referring to the February 4, Jamaat rally at Shapla Chattar, Motijheel. The young generation wants to free the country of the stigma of failing to try the war criminals. Regarding the issue of banning Jamaat-e-Islami, as it came up in the six-point demand of the protest, Majumdar opines that it is time that government decides whether political parties associated with war crimes should be banned or not. Mujahidul Islam Selim, General Secretary of Communist Party of Bangladesh (CPB) agrees, “Jamaat-e-Islami should be banned and are financial sources that is business institutions should be brought under state control on the basis of investigation,” he says, “Banning is necessary but not sufficient. At the same time, we need to continue a cultural, ideological and political movement against communalism.” About Jamaat's power to strike back, Selim refers to the banning of the Nazi party and Ku Klux Klan and observes that these parties did not gain further strength when they were banned. He thus perceives the fear surrounding the ban of Jamaat-e-Islami as unfounded. Worker's Party's president Rashed Khan Menon agrees with Hussain that if BNP continues their affiliation with Jamaat they will continue to lose popular support. “On the other hand, since the Prime Minister herself supports this movement, Awami League will apparently get some advantage.” Awami League lawmaker Asaduzzaman Noor does not want to perceive the impact of this movement so narrowly. He reminds that the AL came to power promising trial of the war criminals, “The party is trying to keep its commitment. So when the young generation protested against the verdict of the tribunal, Awami League has tried to capture that voice through the ratification of the ICT Act.” BNP joint secretary general Ruhul Kabir Rizvi Ahmed, however, declined to comment further on the Shahbag movement than what they stated in their official press release issued on February 11. The Shahbag protest has crossed a fortnight and though organisers have vowed not to leave the streets unless all their demands are met, they are contemplating a change in the form and pattern of their protest. Lucky Akhter, one of the activists of the Shahbag movement and social welfare secretary central union, Bangladesh Chhatra Union, says, “A movement does not happen in the same manner everyday. Its criteria changes.” Her words are complimented by another organiser Imran H Sarker. He says, “If we see that most of our demands are being fulfilled or likely to be fulfilled, then we might bring in a change in its pattern.” Only time will decide whether the fire that has been rekindled in the hearts of millions of Bangladeshis will keep burning and the values for which our freedom fighters sacrificed their lives can truly be established.